Cyber-connected manufacturing systems – also known as Industry 4.0 – improve efficiency and optimize operations but also have the potential to change the way manufacturers and industrial companies run their business. Especially in Europe and North America, manufacturers are quite familiar with the challenges and benefits of the Industrial IoT; now, I would like to take a closer look at the current status of the Industrial IoT in the Asia-Pacific region. 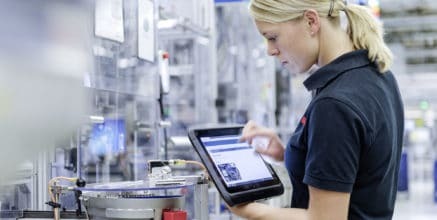 Being responsible for Bosch Software Innovations in Asia-Pacific, my team and I have talked to many manufacturers in various countries throughout the region. We have implemented and accompanied exciting Industry 4.0 projects in various customer factories. But what issues are Asian manufacturers facing and how can they be overcome? Can we even look at Asia holistically or are there major differences between mature and emerging countries in terms of Industry 4.0 adoption? And how do manufacturers actually think about Industry 4.0 in countries like China and India? From our view, especially the first two aspects are becoming increasingly important in the Asia-Pacific region. In fact, Frost & Sullivan forecasts that the Asia-Pacific Industrial IoT market has the potential to grow by a factor of nearly five between 2015 to 2020. Looking closer at the industries that will drive IoT adoption in the Asia-Pacific region by 2020, industrial IoT solutions are among the top three industries. Out of all the Asia-Pacific countries, China is expected to spearhead industrial IoT spending and account for 49% of spending by 2020 – impressive numbers, no doubt. However, Japan, South Korea, India, and elsewhere will also see significant take up of such solutions over time. This seems clear from the numerous discussions we are already having with manufacturers in these countries today. After all, the Asia-Pacific region is the manufacturing hub of the world and will fight hard to maintain that position in the face of increasing input costs, including labor and energy. The Asia-Pacific region is highly diverse with localized characteristics, ranging from technologically advanced and high cost manufacturing countries, to low cost and low productivity nations. Considering the following key factors, countries such as China, Japan, South Korea, Taiwan, and Singapore can be classified as mature manufacturing countries while India, Thailand, Vietnam, Malaysia, and Indonesia are still considered developing manufacturing countries. Each country differs in terms of its level of readiness for adopting Industry 4.0. What are the differences in the perception of Industry 4.0 in mature and emerging countries in the Asia-Pacific region? Frost & Sullivan examined the findings from mature and emerging manufacturing segments by observing China and India, key countries whose views are representative of each segment. Both countries provided differing views regarding proof-of-concept (POC) projects, issues they hope to solve, and challenges faced due to different stages of maturity and readiness. 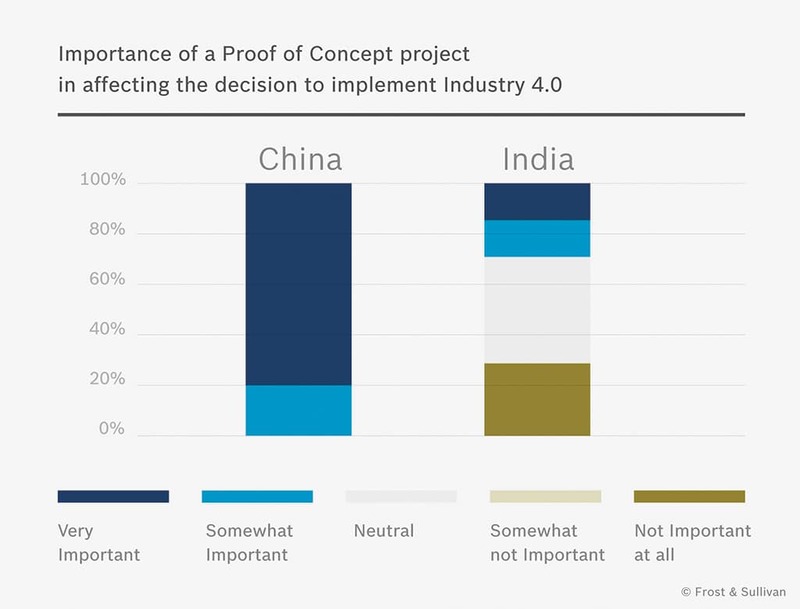 When asked how important a POC project is in affecting their decision to implement Industry 4.0, 100% of respondents from China indicated that it is somewhat or very important. This contrasts with only 29% of respondents from India. The findings show that manufacturers in mature countries such as China are more advanced in their state of readiness for conducting trial projects in their facility and realize the potential benefits of the technology. All agree that a POC project is an important step in their plant’s technology journey. It also points to the intense competition among manufacturers in China. But what issues do Chinese and Indian manufacturers believe Industry 4.0 can solve? Top priorities for Chinese manufacturers include improving efficiency, reducing variability, reducing cost, and improving process visibility. In India, improving quality, reducing cost, and improving process visibility are the top three priorities. The marked disparity reflects the differing levels of maturity. Responses from Chinese manufacturers reflect labor concerns as a key challenge. A lack of qualified staff, high employee attrition, and lack of compatible standards remain key barriers. 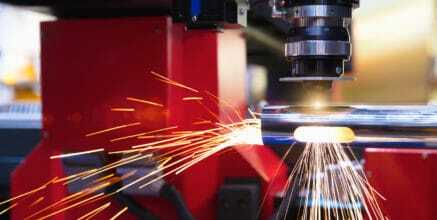 The findings show a consistent response regarding labor issues among all manufacturers, revealing the serious situation facing mature manufacturing countries. In India, the top responses are unclear standards, data security, and compatibility. From this, we can assume that labor issues in mature countries indicate an urgency to apply Industry 4.0 technology to enable manufacturers to do more with the same resources, whereas in India, there is no such clear driver. How to meet business & operational objectives with Industry 4.0? Most production lines have localized sensors for control on the factory floor and detecting anomalies for rectification. 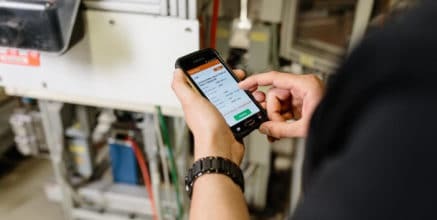 Through connected equipment and lines, Industry 4.0 systems make real-time status information available via remote condition monitoring. By connecting these localized systems and sensors, remote condition monitoring provides the head of operations with a comprehensive view of plant operations across lines and locations. As we continue to witness the emergence of new products and services around us, the IoT opens up opportunities for new business models such as “Things-as-a-Service” that drive revenue growth. An Industry 4.0 system can connect sensor and operations data across multiple machines and lines. This enables managers to receive shop floor visibility and control, and the ability to monitor performance and identify inefficiencies. Sensors can test each unit at every stage of assembly. This reduces defects and identifies any potential problem at the source. 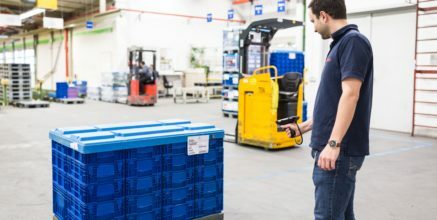 By connecting factory floor systems and sensors, operational data generated through daily operations can be consolidated into a central data store and analyzed. This allows the operator to move to predictive maintenance. Predicting when components will likely malfunction allows manufacturers to identify potential problems early and schedule preemptive servicing. 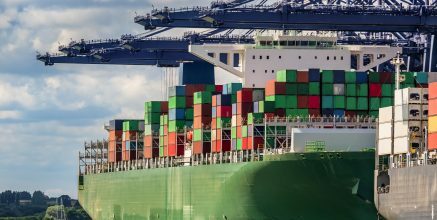 As margins are being squeezed through increased competition amid rising cost, senior managers in the Asia-Pacific region focus on operational improvements and tend to spend on technology that offers a clear and quick return on investment. However, managers are naturally concerned about implementing any new technology in a production environment, and would not invest in such technology without a working prototype. 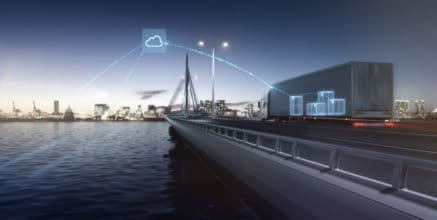 With low-cost sensors, a cloud IoT platform, and rapid development tools, a POC project can be launched to prove tangible ROI to management before implementing it in production systems. These small steps taken to verify Industry 4.0 technology in the company’s environment should be treated as learning experiences. Such projects help to inform companies about the extent and limitations of the technology, and to pivot and move in a more feasible direction before fully implementing a project. Launching an Industry 4.0 POC project does not mean disrupting operations or retiring functional equipment. Working with existing infrastructure maximizes the company’s investment while improving productivity. A POC project does not make changes to the production workflow, but rather gathers data for analytics to identify areas where efficiency gains can be made. 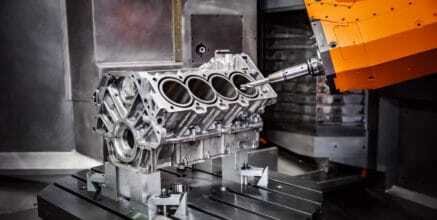 This approach minimizes any potential disruption to the production line. Find out how The Yield uses IoT in agriculture. Device management for filters: How our customer Mann+Hummel is using the IoT for smarter cleaning technologies. 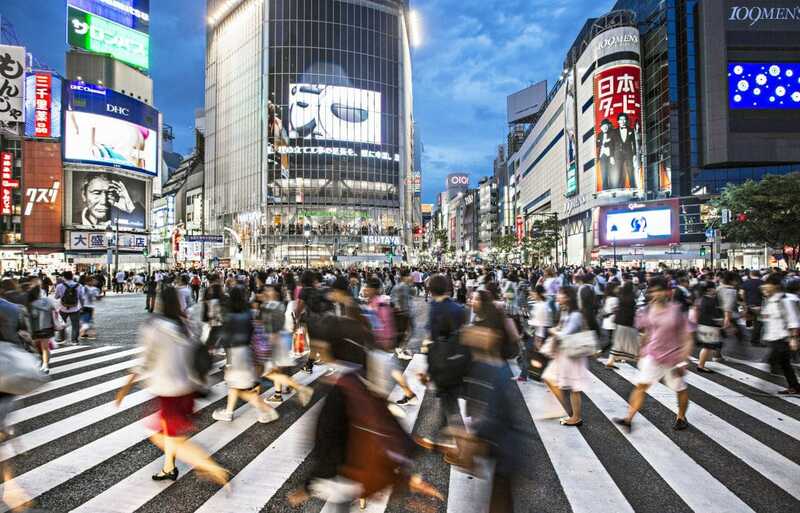 Learn why Asia is a forerunner when it comes to digital transformation.